I have seen Thomas Henry sodas on the mixology.eu blog before. The company from Berlin is advertising, that it was co-created by experienced bartenders. And now it is available here in the UAE. The small 200 ml bottles look good. Its modern, but also classy. Well done. The ginger ale, is quite dark, if compared with Schweppes. The ginger beer [called Spicy Ginger] is off white medium-opaque. The bitter lemon has the same half-translucency however with a hint of green. The soda, elderflower tonic and tonic water are clear [it seems, that the tonic has a hint of blue - but I could be wrong]. The ginger ale smells quite gingery. Nice. The tonic has a quite sherbet nose [you know- the bubbly fizzy powder, you had as a kid]. Hints of citrus… pleasant. TH Bitter Lemon has a very pronounced citrus zest smell - maybe a bit on the oxidized citrus side - but overall good and much better than Schweppes. The TH Spicy Ginger surprises with a dried ginger nose - almost pure powdery ginger - interesting. The TH Elderflower Tonic: restraint flowery [yes elderflower] aromas. Pleasant and light. The taste of the tonic is quite artificial. The sherbet and citrus notes are gone and just quinine is ruling - unfortunately in not a great way. In comparison, Schweppes is much zestier, snappier, definitely not worse in any way. TH Bitter Lemon taste much more citrusy and edgy as Schweppes and it is a bit more bitter and less sweet. Maybe a bit too oxidized [think Mountain Dew]. TH Spicy Ginger really disappoints in the taste. Compared to Bickford Ginger Soda [my commercial benchmark - sorry, no Fentimans avaiable here], it looses on all taste notes. It has a weird bitterness, and an quite artificial overall taste. Compared with house made ginger beer, the homemade product is taking it all. If you know, how easy it is to make ginger beer at home, you would never ever buy a commercial product anymore. One has not to dismiss the effect of being different. Thomas Henry is disappointing a bit with its overall quality. It is not so different as the other mass produced products like Schweppes and Canada Dry [still one of my favorites in the tonic category]. However it scores with a really cool design and a bottle size, which makes sense as a mixer or single serving. And given, that it is nearly impossible to get quinine in some markets [like the Middle East], this flavor is worth to stock Thomas Henry [at least the Elderflower Tonic]. Thomas Henry was sent by the trading company [Freshexpress LLC] as samples. No payment was given to me. Thomas Henry also sells Soda Water - however I reject to review Soda Water [as it is simply drinking water with CO2]. I always recommend, to either way buy local soda water or even carbonize local or even filtered tap water yourself. 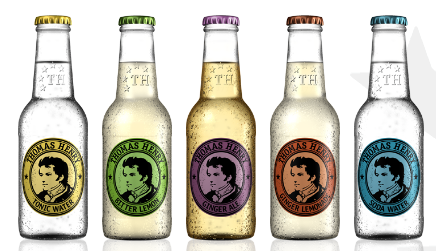 In a future post, I will definitely try the sodas of Thomas Henry in some mixed drinks. Update: I tried the elderflower tonic with Tanqueray ten [not one of the biggest sledgehammers in the industry]. Even with quite a small measure of gin, the elderflower note seemed to disappear.